Made in USA from ultra absorbent, imported, Certified Organic Turkish Terry Velour. 30 x 30 (76 x 76 cm) baby hooded towel with satin trim. Designed with baby's best interest in mind and your style at heart. Hood keeps baby cozy after bathtime or pool time. 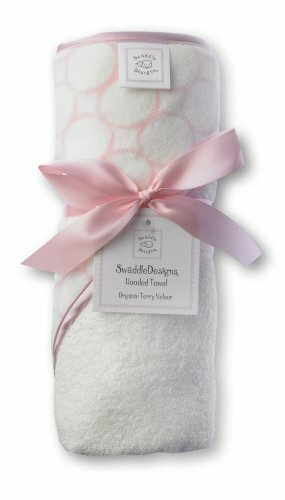 SwaddleDesigns Organic Hooded Towels are made from the finest Turkish Cotton Terry Velour. After bathtime or swimtime, lovingly wrap baby in our soft and absorbent hooded towels. 30 x 30 (76 x 76 cm) inches and made of 100% Certified Organic Turkish cotton with a silky satin trim, this cozy hood will keep baby's head warm and prevent chills after bath. Coordinates with a variety of our quality baby essentials. Machine wash gentle.